Summer on Cape Cod means sandy beaches, fried clams, and — too often — mileslong traffic jams. But starting next May, visitors will be able to avoid short tempers and long lines of brake lights by taking a new weekend-only train between South Station and Hyannis. The service, called CapeFLYER, is scheduled to start in time for Memorial Day — the traditional kick-off of the tourism surge – and end in September, said Wendy Northcross, chief executive of the Cape Cod Chamber of Commerce. With the Cape’s economy so dependent on tourist dollars, the arrival of limited train service to the region’s largest community is being eagerly anticipated by business owners and officials. “Some day down the road, I would love to see daily service from Boston all year round,” Northcross said. The Cape Cod Regional Transit Authority, which will oversee CapeFLYER, expects it to appeal to people put off by summer traffic backups at the Sagamore and Bourne bridges. International visitors to Boston are another pool of likely passengers, Northcross said. 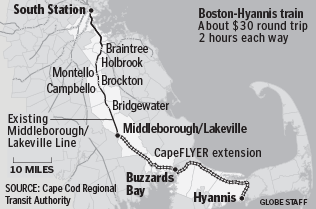 The train will follow the commuter rail route to ­Lakeville — making all its regular stops along the way — then continue on with new stops in Buzzards Bays and Hyannis, according to Thomas Cahir, executive director of the Cape Cod Regional Transit Authority. A round-trip ticket will cost about $30 and take two hours each way. One train run will be from Boston to the Cape on Friday nights and Saturday and Sunday mornings. Return trips are scheduled for Saturday and Sunday nights. Capacity will be about 1,000 passengers a trip, depending on the size of each run. Onboard bar and food service are also planned, Northcross said. “It will take as long as by car, but you can be enjoying the view, and you can have food and drink,” she said. The goal, Northcross said, is for the train ride to become part of the vacation experience, much like taking a ferry from Boston to Provincetown. Trains out of Boston will arrive at the Hyannis Transportation Center, currently used for bus services. From there, it takes only a few minutes to walk to downtown Hyannis or to the ferry docks to catch a boat to Martha’s Vineyard or Nantucket. Each train will also include a bike car, officials said, for those who want to supply their own on-Cape transportation. 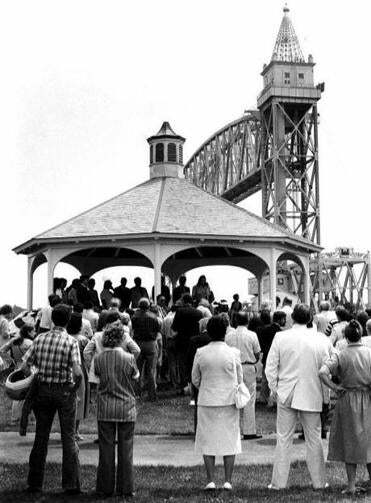 Passengers awaited the arrival of the Cape Cod train at Bridgewater and Buzzards Bay, in June 1984. The last passenger train service between Boston and the Cape ended a quarter-century ago, one Cape official said, because there were too few riders. 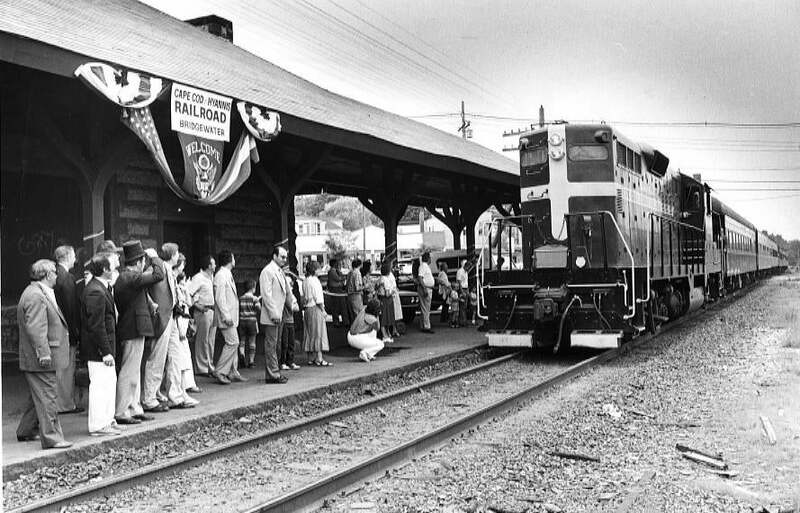 The last passenger train service between the Boston area and the Cape began and quickly died out a quarter-century ago, Northcross said. It failed because of simple economics — there were too many trains and not enough passengers, she said. Operating the restored service is expected to cost $160,000 to $180,000 in its first year, Cahir said. He was unable to estimate how many people will ride the train, but he expects the service to generate enough money in fares and concessions to cover operating costs. Local businesses are excited that trains will be rolling into town, said Elizabeth Wurfbain, executive director of the Hyannis Main Street Business Improvement District. The route ends just around the corner from the shops and restaurants of downtown Hyannis. “Anything that moves people on to the Cape is good, and I think train service is a fabulous way to do that,” said Peter Martino, owner of the Heritage House Hotel, located almost across the street from the train station. But news of the service has some Cape Codders wondering whether their transportation needs will one day receive more attention. The region has been wrestling with the loss of young people who can’t find stable full-time jobs. Some say daily rail service to Boston could make it easier for them to stay on the Cape. Commuter train advocates, however, are likely to be disappointed, Cahir said. The tracks on the Cape are simply not in a condition to support the high-speed service required to make it feasible, he said. Upgrading the rails would be costly, he said, and a commuter service would be disruptive to neighborhoods near the tracks. “There is no opportunity or possibility that commuter service will ever emanate from Hyannis,” Cahir said. But even more frequent summer service would be an advantage, allowing Cape residents to act like tourists by escaping to the city.